If you’re looking for an effective way to make the most of your book, consider the experience of The Toronto Globe and Mail. A few years ago, Canada’s largest newspaper gathered information about its advertisers and discovered they fell into three groups: The top 900 who accounted for 75 percent of advertising revenue and received regular contact, the middle 5,000 who generated about 20 percent of revenue and were contacted infrequently, and the bottom 6,000 who provided 5 percent of the business and never were contacted. Does that breakdown sound like your book? If so, you’ll be interested in learning what The Globe and Mail did when it discovered that 2,900 customers in its middle group of 5,000 had spent $14.7 million two years earlier but had not advertised at all in subsequent years. Since the newspaper’s sales force was uninterested in contacting these advertisers, the newspaper hired a telemarketing firm to call the 2,900 and find out why they stopped advertising. There were a variety of reasons, but simply by calling, reestablishing contact and talking about the newspaper, the telemarketers brought in $2.9 million in advertising revenue. If, like the newspaper, you’d like to get more from the underserved middle of your book, consider creating or improving your marketing database. The basic idea behind database marketing is to create a relational database that stores customer names, addresses and emails, plus their transactions, their income, assets, age and investment goals. This database is used to communicate with customers personally in messages that are welcomed and build loyalty — birthday cards, newsletters, market tips and other personal messages. These messages reinforce loyalty and improve cross-sales and up-sales. You probably already have all or most of the software tools you need to do the job. While many companies use giant, enterprise-wide software solutions from companies such as Siebel Systems, your PC-based contact management software can work almost as well. If you use ACT!, Outlook, Goldmine or Broker’s Ally, for example, you have capacity to store and manipulate the information you need. But, as Jaime Punishill, a senior analyst at Forrester Research in Boston notes, any software is only as good as its usage. Contact management systems can provide a wealth of marketing information only if brokers incorporate the systems into their daily work routine and use the software as more than a scheduling tool. While company-wide systems can populate account data and holdings automatically, a broker’s own marketing database still can be a very productive tool. 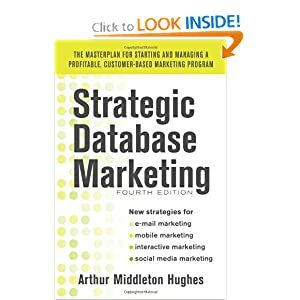 The beauty of database marketing is that it has become a science as well as an art. It’s scientific because all communications are considered tests that can be measured against a control group of customers who do not get the communications. This enables you to see precisely how well the messages you sent are working. Using the data in the database, you can develop statistical models that predict accurately who will respond and purchase and who is unlikely to do so. That way, you can avoid wasting money on unsuccessful promotions. The yardstick used by all major practitioners of database marketing is lifetime value, which is a measure of the net present value of the profit you should receive during a customer’s “lifetime” with you. It is a measure of the future based on historical patterns and it takes into account the cost of acquiring a customer and the natural attrition of a customer base once acquired. How can database marketing improve lifetime value? Communications can be used to boost the retention rate, increase assets per customer and reduce acquisition costs. Overall, it is possible to make significant increases in lifetime value through database marketing. Now let’s turn to the database itself, which should be the repository of customer preferences that you unearth when talking to your clients and prospects. Is a client investing for retirement? Is she preserving an inheritance? Is the money earmarked for a child’s education? Answers are stored in the database and are used to craft the communications. Ask customers how they like to receive communications. Do they want letters, emails or phone calls? Would they like a monthly newsletter? Do they like visiting Web sites regularly? These answers also are stored in the database, and software can be used to generate the outgoing messages automatically. Given the different goals and preferences of so many clients, it’s easy to see how any normal broker would be overwhelmed by all the follow-up such data would require if handled manually. A database, however, manages this complexity with ease, generating compliance-approved communications that can be dispatched automatically or batched for broker approval. Priority C customers are those with either very low lifetime value or very low likelihood of defection (they are very loyal). Why spend a lot of money and resources working to retain Priority C? You should devote your resources to Priority A and B clients, who are valuable and might leave. By analyzing clients this way, you greatly simplify your retention problem and cut your costs. To use your database for prospecting, consider what’s known as the two-step method. First, compile a list of mail-responsive people in your area who are interested in financial matters. In general, these people are subscribers to Money Magazine, The Wall Street Journal, Barron’s, and similar publications. Put these names into a prospect database and mail them an offer of a free copy of a report on a timely topic by a well-known expert, perhaps your firm’s chief strategist or economist. In return for the report, respondents are told they will hear from you. Even though only a small percentage responds, the two-step process works well because you are contacting only those people who are interested in hearing from you. If you do a few of these mailings, you soon will be able to calculate the percentage of respondents who become customers. This percentage is usually quite dependable. One company in the resort time-share business used the two-step process and offered a family vacation at a nearby resort for as little as $69. It found that 10 percent of those accepting the invitation always buy a time-share (costing between $15,000 and $25,000). Large companies use models to predict which of those mailed are most likely to respond. Eliminating the less likely responders improves the response rate and the sales rate. One company I’ve studied used a model to improve their targeting and increased sales by 45 percent and profit by 96 percent. These results are not unusual for companies that have created and used a sophisticated marketing database for prospecting. Securities firms don’t prospect on a corporate level; they leave that up to you. So for you to be more successful, why not adopt the techniques of leading marketers and develop your own marketing database?